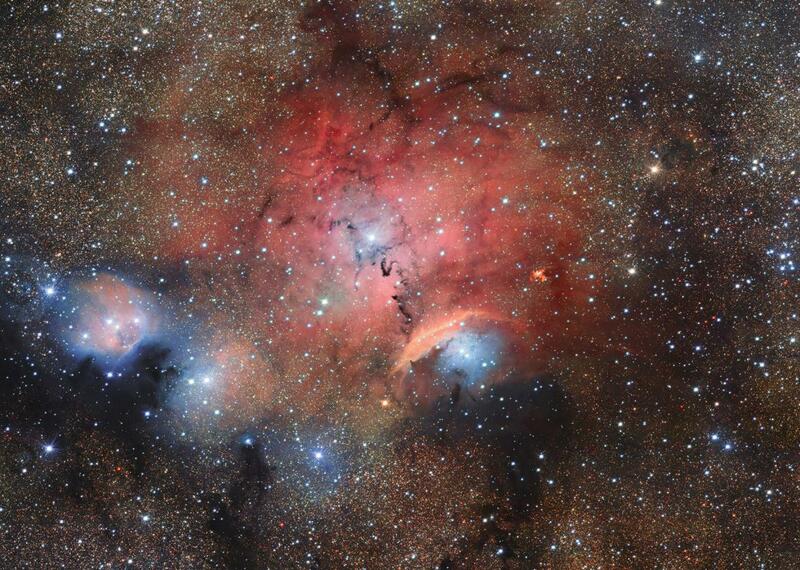 What a star nursery looks like. It sure sounds cute, but it is really quite violent. The stellar nursery called Sharpless 29. A nursery of newborn stars in outer space might sound adorable and sparkly, but the reality is something much more violent. Stars are gigantic spheres of gas and dust, and when they’re infants, they tend to be a lot like human babies, spewing out gobs of hot carnage in every direction. Bring a truckload of these things into one tiny little region of space, and you suddenly have a cosmic patch of tempestuous, astrophysical hell. That’s what scientists are looking at in a new image of Sharpless 29, a stellar nursery 5,500 light-years away in the constellation Sagittarius. Captured by the European Southern Observatory’s VLT Survey Telescope at Cerro Paranal in Chile, the new image depicts a mass of hot, active interstellar gas creating a perfect breeding ground for new stars. As you can see, the focal point of Sharpless 29 is the central nebula, a crimson, warped cosmic body stretching out over several light-years, filled with enough turbulence to destroy stars that unwitting try to form within it. Most of the young stars in the VLT image are less than 2 million years old—mere seconds on the scale of the cosmos. Their young age means they’re currently pulsing erratically with bouts of radiation, each attempting to carve out different cavities within the region. If you look closely, the central nebula itself has an ever-expanding nook sculpted by the constant stellar winds and piling up excess material into the surroundings. Meanwhile, the swirl of gas and dust mixed with ultraviolet light from newborn stars creates a very intense glow, augmenting the shine of the stars themselves. The blue light is caused by the scattering effect of small particles. The darker, tentaclelike clouds are filaments made of accumulated dust. Sharpless 29 is kind of a cornucopia of physics stuffed into a single place. There aren’t very many parts of the galaxy that so intricately detailed by newborn stellar reactions. For astronomers, this is a prime window into how stars form and evolve, the influence of newborn stellar radiation on dust and gas, and how the properties of magnetic fields are affected by such a violent myriad of factors. That information itself gives us more insight into how the sun, its planets, and the Earth came into existence. And of course, the images are gorgeous.